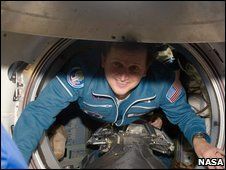 Charles Simonyi, a former Microsoft executive, has successfully landed back on Earth after becoming the first-ever space tourist to visit the International Space Station twice. Simonyi spent 11 days in space after he blasted off on 26 March and has been helping astronauts on the space station conduct scientific experiments. In all it cost billionaire Simonyi £24 million for the trip, and it looks like he will be the last space tourist for some time, as the Russian Soyuz capsule which took him to the space station is to be used to transport more astronauts to the ISS to help service the station. To prepare for his first space mission, Simonyi trained at Russia's infamous Star City space boot camp. His first visit to the ISS was in April 2007, where he commented to journalists: "It is amazing how it appears from the blackness of the sky. "It was very, very dramatic. It was like a big stage set, a fantastic production of some incredible opera or modern play. That's what I was referring to when I said I was blown away."